Welcome to Borgmanns Add 1! : And then there were FOUR! 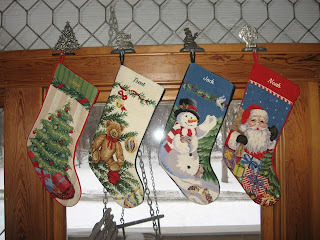 Josie's stocking arrived in the mail today so we hung it up and wish she was here to see it. No news to report on our LOA so we're trying to focus on Christmas and trust God's timing. The boys are done with school for a couple weeks and we're expecting a winter storm. I'm looking forward to staying home and enjoying family. We'll play some games, watch some movies and enjoy being out of the rat race for awhile. I hope you all have a very Merry Christmas with your families!